Well … this 43-year-old “girl”, professional speaker, digital nomad pioneer, and business owner of 14+ years who presented 5x in 5 days to audiences of 200+ per day … was amused that he would use his stage in this way. Unlike most other RV trainers and speakers who focus only on the mechanics of things and don’t address the real, practical issues related to RV life, I speak and coach and teach on all the thing … from finances, meals, health, relationships, safety, and so much more. Another notable difference is that most RV trainers in the industry are gray-haired white men, as was the man who chose to speak about me from his stage. Thankfully, he of course does not represent all seasoned RV professionals. “Tara and Carl bring so much experience and knowledge to living on the road and that really comes across in their seminar. This was the first year we included Nomadic Living as a topic at the Florida RV Supershow in Tampa, and based on the size of the crowds alone, it was a hit! We are excited and determined to be actively changing the narrative and helping woman and couples of all ages to experience the freedom of Nomadic Living. And, oh, we are just getting started…. ==> Are YOU a woman in a male-dominated industry? ==> How do you respond when someone uses their “stage” or their “office” or their platform to try to belittle you or make you look bad or incompetent? ==> Are you amused? Are you angry? Perhaps a bit of both? 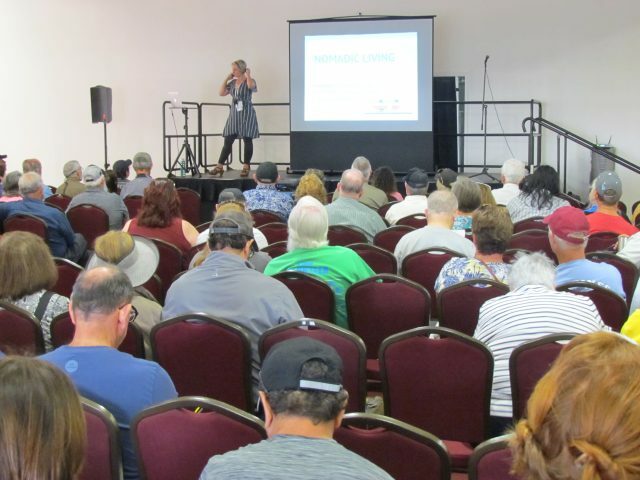 After much thought, preparation, practice and planning, I stood on stage as the only female speaker at the 2019 Florida RV Supershow a few weeks ago, presenting on the topic of Nomadic Living. Making my way into a male dominated industry has definitely been interesting and, for the most part, it’s honestly been delightful. As a whole, my experience of RV culture has been that it’s full of kind, generous, friendly people. That said … I had one rather unsavory experience that, I think, is important to share. On this particular morning, after having presented my Nomadic Living seminar (I had the 10am spot, for 5 consecutive days) I walked into the seminar room, both to hear one of the other seminar speakers present, and to collect any of my remaining flyers while I was there. As I walked in, the man at the front of the room was talking about ME. During his introduction, he remarked, “The girl who leads the morning seminar didn’t clean up after herself. There are flyers on your seat that are of no use to you.” <<< word for word. I was stunned, and a bit irked. But, more than anything, I was amused. While there were flyers for all kinds of things in the room (mechanical resources, RV tour companies, and the like) he made a point to mention mine – and me. Such grace. I, for one, am grateful for all the YouTubes and articles that you’ve made available to those of us who are getting into the rhythm of this lifestyle. You have inspired this namad-newbee and continue to provide exceptionally helpful information… and a lot of giggles, too. I couldn’t agree more about the line: “You never look good trying to make someone else look bad.” A dear friend used to tell me, “Move along, nothing to believe there.” Thanks for all you do, Tara. Awww…. well, it’s great to hear that “exceptionally helpful information” and “giggles” are being received! 🙂 I love your friend’s comment, “Nothing to believe here!” I’m going to remember that. xo Here’s to the journey, CK! I love how grounded you remained and how you were able stay connected to your authentic truth regardless of the misrepresentation. Thank you for sharing your insights. Are you burnt out on the status quo? Is fear holding you back from achieving your dreams? What this client did left me shocked! Tara Sage Steeves on What this client did left me shocked! Zeenat Merchant Syal on What this client did left me shocked! CK Kochis on What this client did left me shocked!